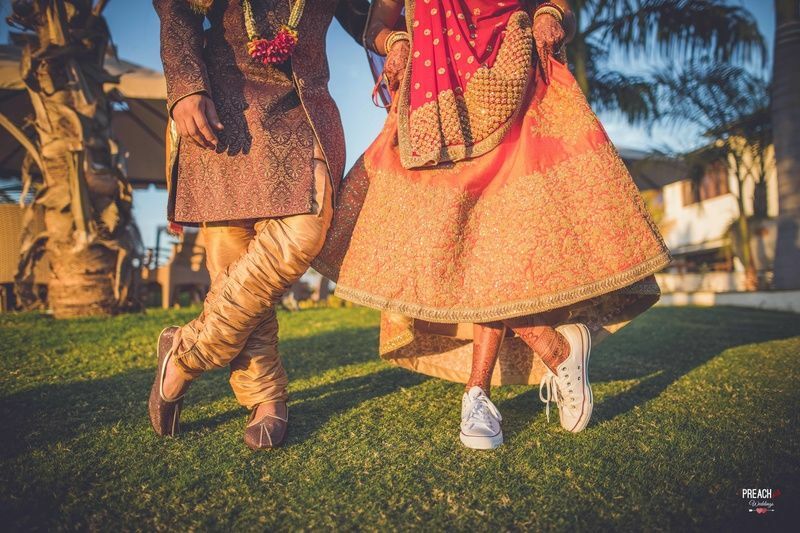 So destination weddings are the new big thing to happen to Indian weddings, with everyone choosing to combine a vacation and a wedding for themselves and the guests, and why the hell not? It becomes more memorable than a normal wedding in your hometown, and like we've told you here, it doesn't always have to break the bank! 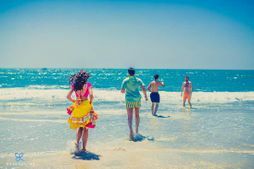 So here are some awesome tips and reasons to have a destination wedding on a budget- don't blame us if you get tempted to change your plans! This is what probably will make the most difference to your destination wedding budget. 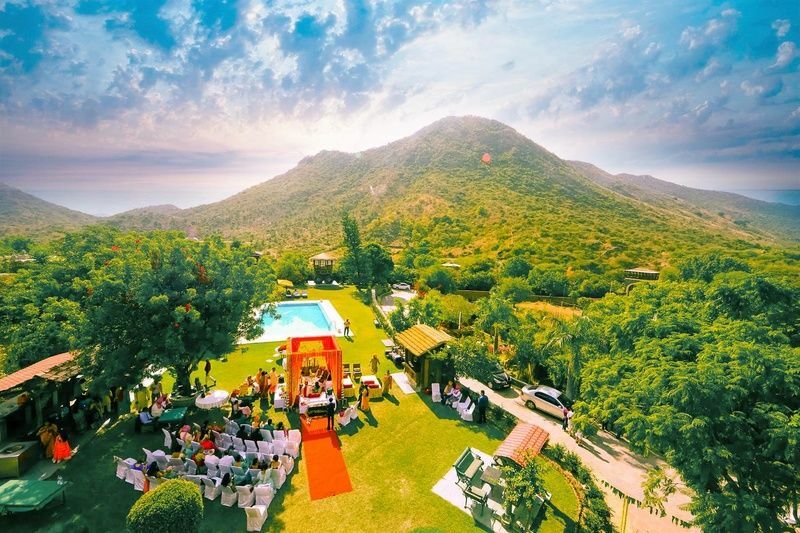 We have already compiled a neat list of places where you can have an intimate destination wedding in under Rs 30 Lakh, so make sure you give that article a nice good consideration! Make sure the place is accessible easily by rail or by air (direct), so you do not have to make lavish arrangements from one city to another! Make sure the place is gorgeous in all it's natural beauty, so you don't have to shell out a lot in making it pretty. 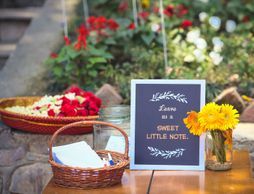 We don't mean plan the wedding in the middle of the monsoon, but generally- make the bookings in either a season which is not a hot-shot wedding season (which means vendors will quote lesser) or an off season or lighter season when it comes to the location you're choosing, which means bigger discounts at the venue or resort. This works best, especially since you can save a lot of transporting people from one location to another, and it generally means a happier atmosphere as everything is happening at the same place. Plus, the chances to get a good discount increase! Get this straight- a budget destination wedding means one that is intimate- with just the people you really really would want at your wedding. 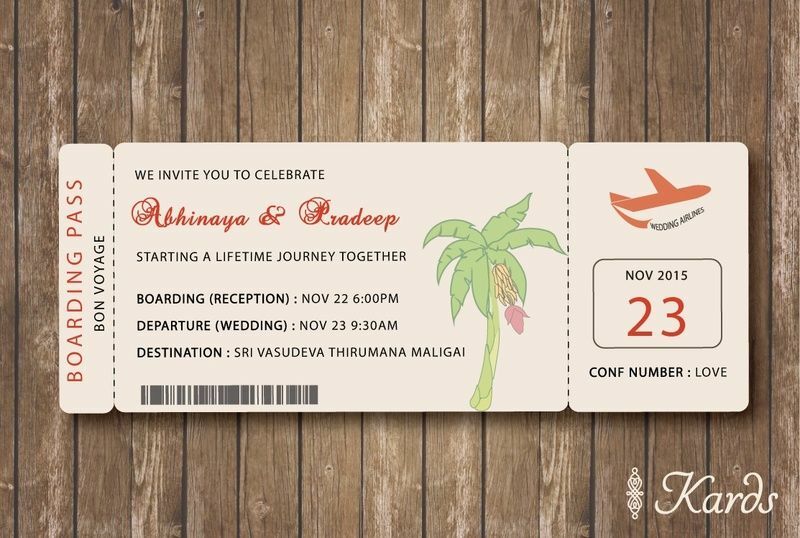 Keep the guest list at around 50-100 and you'll find it very easy and economical to plan and execute your destination wedding. Last minute destination weddings will not come cheap. Book everything- venue, hotels, airline, train tickets- everything as early and in bulk as possible, so that you can get good deals and save a lot of money in the process. As soon as you have a date and finalise on a location, we'd suggest book the best venue you can afford! This is a secret a wedding planner told us in this article. Some resorts will throw in a lot of things if you can guarantee them a minimum number of guests or rooms. they might give you a free wedding hall or some good discounts like free minibars, free wifi, salon discounts etc if you promise a certain number of guests- so that can really save some big money. But keep in mind this will work well for local resorts and hotels- not the big international chains! A budget destination wedding is very doable if there aren't too many events and the stay isn't very long. Keep it as a one night, 2 day or max 2 nights 3 day wedding. It also helps to limit your nights at the resort. An evening wedding can mean people leave by morning and the remaining the day after. Be practical. While a budget destination wedding is very much possible, the very essence of it means that you might not be able to have everything or plan everything down to the very last detail. Figure out what is really most important to you and make sure you know how involved you can be with picking those things, and how much extra it will cost to pick things that are “outside the box.” So choose wisely. Minimal decor elements can cut down your costs by a lot, so do not go over the top! If you choose a venue with a stunning backdrop, you won’t need to break the bank trying to cover it up with expensive flowers and decoration. Nearly all destination weddings on a budget take advantage of their setting’s natural beauty. Pick a venue that does not require a lot of tenting, which will save you a lot of money. Flowers can really eat a up a big chunk of your budget. Either use more greenery, or consider cheaper and more innovative centerpieces like shells, bottles or fruit centerpieces, which look just as stunning and come cheap as well. If you do want floral arrangements, use local flowers instead of getting them from somewhere else. You'll get the best costs and flowers are pretty anyway! Also, stick to just one or two kinds. Have bigger tables, so you can save on centerpieces and table cloths. Instead of sit-down functions, consider standing buffets, with casual seating options. Have main big functions in the day and limit night events to indoors- you'll save big time on lighting costs. DIY as much as you can. Some neat ideas here and some decor hacks here. It saves a lot because you already have the destination you want and it's picturesque. Choose local food and drinks rather than importing it from somewhere else. Go easy on the menu. No one can taste 50 dishes in one go. So be wise with your food choices. Choose grand lunch or brunch events rather than dinner ones as they turn out to be cheaper. 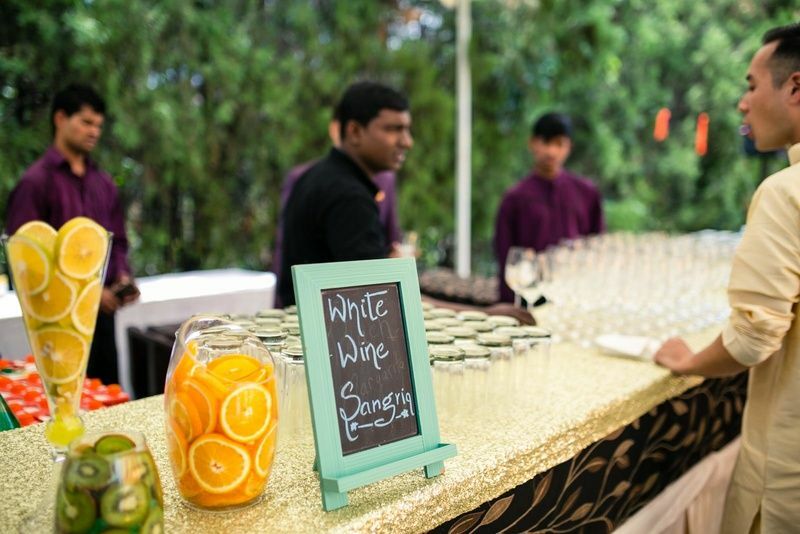 Offer beer, wine and a signature cocktail and mocktail instead of a full on bar. 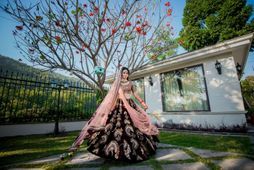 How sad would it be to pick a gorgeous or expensive lehenga which is too heavy and doesn’t travel well, or one which seems totally inappropriate for your casual, laid-back beach wedding? Keep your destination and atmosphere in mind before you pick your wedding outfit. Bug bulky lehengas can be hard to fly with. Be practical in your approach, which could also save you a lot of money. 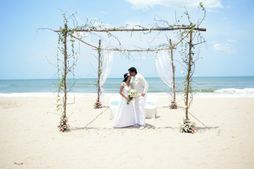 There are a lot of extra costs that come with a destination wedding, which might slip your mind but lead to big bills later, throwing your budget way off. Here are some of them. If there’s anything you’d like to ship to the venue (decor elements, favours or outfits) ahead of time, keep those costs in mind when you’re considering your bottom line. The same goes for people as well! Are there any people like an MUA or photographer who you’d like to fly in? Paying for their flight and hotel stay should also be factored in. Fly in only the most important vendors and try to source the other ones locally. Local transportation for guests (some of them might wanna do some sightseeing as well), might be higher than in a big city, so keep the rates in mind. Phew, that's quite a lot... but trust us, it'll be so worth the effort when you're able to pull off an affordable destination wedding! So what are you waiting for, start planning your destination wedding right away! 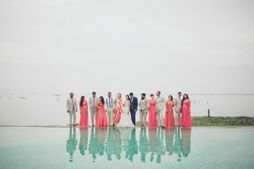 How To Make Your Wedding Party Bond at a Destination Wedding!